OK, so our canteen is not the only source of unintentional comedy at work. We also have a fitness room, where we can do all sorts of fitnessy stuff. Next to the fitness room are showers. 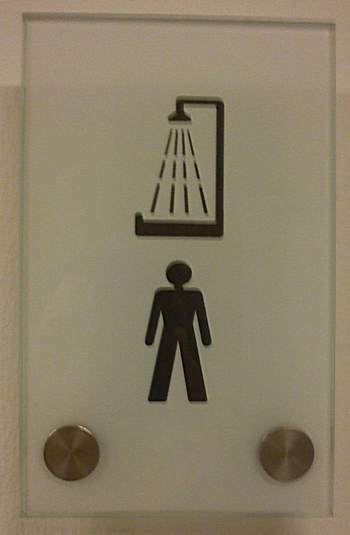 There’s a sign that helps you identify them as such, except it’s been made by a person who’s never seen a shower before. If that was a real shower it’d be either the most elaborate prank ever pulled or the pinnacle of insane engineering. @BakedAlaskaInOr Hehehee that could’ve made for one curious disco concept! During the fake bird flu outbreak here in the states, and even now, they put up signs in every government and corporate office building. The signs? Instructions on how to wash your hands. And of course, they are all pictures. Just in case you can’t read.